WRAPID-350 is designed for wrapping Cigarette Packets and other Products having similar dimensions. It wraps the product in heat sealable cellophane or BOPP. A tear tape integral with the film makes film removal very convenient. 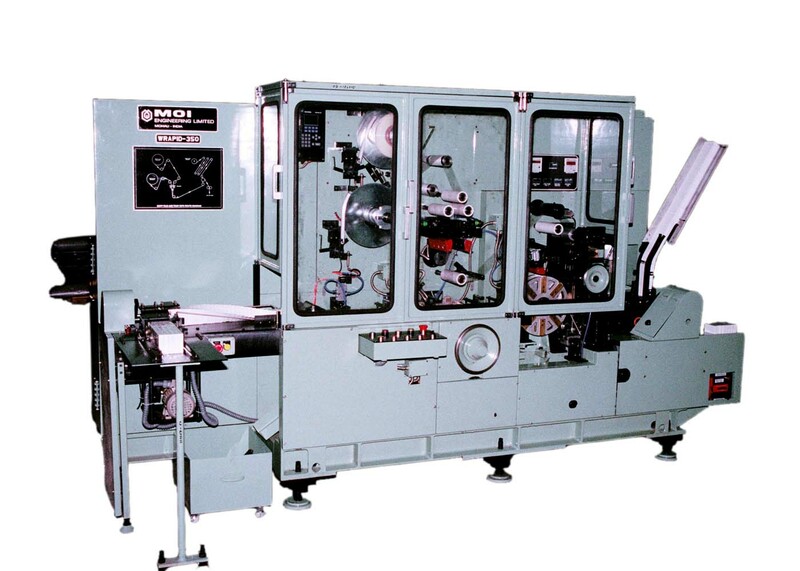 The machine has twin roll film dispensing system with quick change over Suction bands together with static charge eliminator ensure continuous and positive film feeding. Application of state of the art technology using VFD for speed control, PLC, operator interface for fault display, parameter setting, optical & fibre optic devices, SMPS etc. ensures user friendliness & consistent repetitive performance and higher productivity. Wrapid-350 is a robust, highly reliable, operator friendly machine having high productivity and efficiency with neglible rejections.